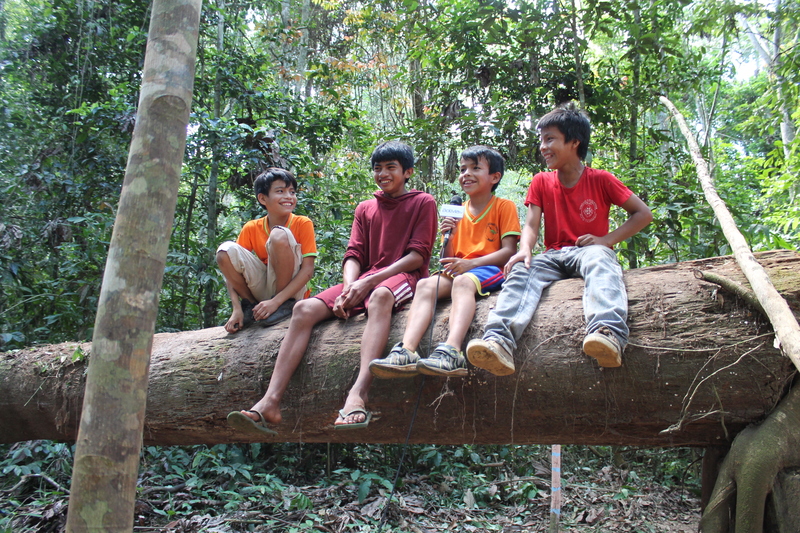 The Darwin Initiative Forest Futures project aims to mitigate threats to natural forest in the Bolivian Amazon by raising awareness of the value of these forests, supporting the diversification of non-timber forest products and adapting a soil-restoring agroforest technique to the Amazon. The project was launched in 2013 and this week we held a half-day conference in the capital of the Pando, Cobija. The aim of which was to disseminate our results and outputs to local decision makers who included the Vicegovernor of the Pando, Dra Paola Terrazas Justiniano, the Mayor of Cobija, Luis Gatty Ribeiro Roca, representatives of the Universidad Amazonica del Pando, the Autoridad Bosques y Tierra (Forest and Land Authority) several NGOs involved in rural development and journalists from five television stations and two radio stations. We had 73 people participate in the meeting which for us was a great success. The aim of this was to highlight the value of natural forest, both as a source of ecosystem services on which the Pando and the region depend, but also as a source of potential products which can either be harvested directly (non timber forest products) or cultivated in agroforest systems. The idea being that the perceived value of forest increases making unsustainable alternatives such as pasture for cattle or as sites for slash-and-burn seem less economical. Juan-Fernando Reyes from Herencia presented his vision for an integrated forest-based economy and future for the Pando, Bente Klitgaard outlined how the relationships between Kew, Herencia and our rural partners had developed and Alejandro Araujo Murakami presented a summary of the plant diversity of the Pando, ca 3,000 species and how this translated into stored carbon. I presented an overview of how Inga based agroforestry could help restore the soils of abandoned slash-and-burn sites to productivity and support sustainable agriculture in the region. In addition, with 73 participants at the conference it was a good opportunity to launch our Inga agroforest manual and promote the forthcoming book on economically promising Amazonian fruit tree species. Since the start of our Forest Futures project I had been thinking about the best way to support the production of agroforests once we have left. We had committed to produce a manual but my initial thoughts were that this is a little old-fashioned and that an electronic publication formatted for mobile phones would be a good option. The reality, however, is that Bolivia has very poor internet access. Even in Cobija, the capital of the Pando, internet acesss is sporadic and poor. Once in the field it is only available at a few points along the main road . We therefore decided to opt for a printed manual, of the size that it will fit on a narrow shelf or somebody’s day pack and on high quality paper that will resist the high humidity of the tropics. The next decision was how to best communicate to the people we working with. I believe that a majority text-based format would not be of great interest or very accessible for the communities we work with. I decided on an image-rich poster-like format. This was because posters remain a major communication tool by Government and NGOs in the region and so local people will be familiar with them, secondly I assumed that Governments and NGOs know what they are doing! Following this I had to think quite hard about content. Whilst the mechanics of establishing a plot are relatively straightforward to explain what has struck me working with rural people is that communicating the underlying principles of agroforestry as we practice it is very challenging. This is in part because a lot of their knowledge on soils and and nutrient cycling is based on temperate systems, either in Europe or the Andes where soils are replenished by the action of frost or weathering of rock. 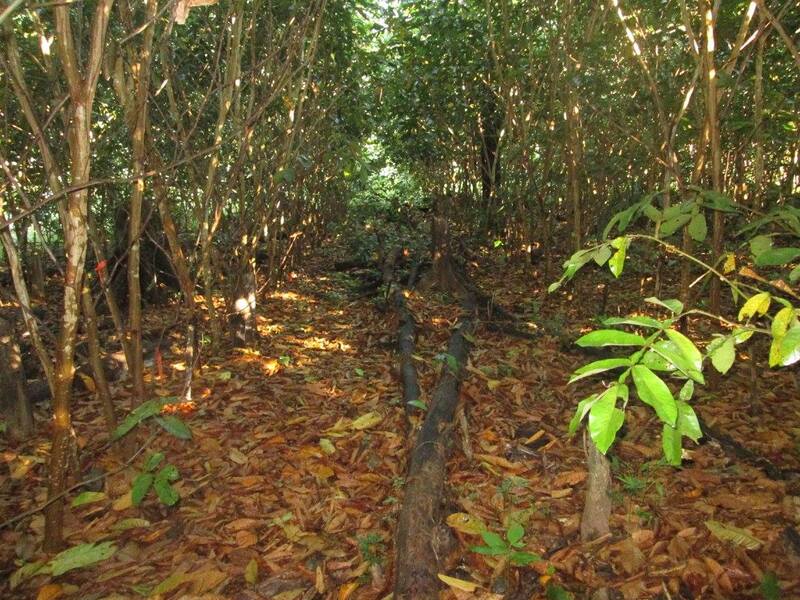 Amazonian soils have been leached over millions of years and hold few nutrients for plants but this is not obvious looking at the lush dense forest growing on them. So not only do we need to explain that the soils are very poor but then explain how such rich forest grows on them. Similarly, it is less challenging for people living away from the Amazon to accept that cutting forest is not sustainable, but quite a different thing when it is your livelihood that depends on slash-and-burn and when you have always been surrounded by forest for as far as the eye can see and that this has been the case for as long as anyone can remember. The upshot of these considerations are a substantial introduction that attempts to explain all of the background and context whilst assuming little prior knowledge. You can download the pdf version of the manual here. A printed version is available on request for those working in Latin America. Dos años después de plantar nuestra primera parcela en Motacusal, la comunidad acaba de terminar la primera poda de los árboles. El denso follaje de los árboles de Pacay (Inga) se ha reducido a una capa vegetal y los tallos sacado para servir de leña, dejando aproximadamente 1/3 hectárea de terreno fértil para cultivos anuales como maíz, arroz o frijoles. Es la culminación de más de dos años de trabajo y testimonio del esfuerzo de nuestro equipo de campo, dirigido por Ingeniero Forestal, Rolman Velarde. Dejaremos la hojarasca pudrirse un mes antes de sembrar las primeras cosechas. Gestión de la parcela de Motacusal está siendo supervisado por los niños de la comunidad a través del programa ‘Bosque de los Niños‘ lo que significa que pueden elegir lo que van a sembrar. Esto es importante para la participación de los niños, y también para la comunidad, uniendo nuestras parcelas con su recurso más valioso y llevarlo a buen término es un poderoso símbolo. Los niños han experimentando con diversas semillas para plantar como parte de su currículo productivo y estoy entusiasta de saber lo que han sembrado en siguiente mes. Sin embargo quedan algunos desafíos, por ejemplo el tiempo anómala asociada con El Niño podría dañar las cosechas o al Inga. Rolman Velarde explicando a las otras comunidades que participan cómo podar los árboles de Inga para poder cultivar los callejones. Imagen: Victor Soruco, Herencia. Se utilizó la oportunidad de que sea la primera parcela que se podado para invitar a representantes de las otras comunidades participantes: Palacios, San José, Jerico y Monte Sinaí. Esto nos permitió formarlos en la poda, también para ellos era una oportunidad para tener una idea de como sus parcelas agroforestales se verá en más o menos un año. Two years after planting our first plot at Motacusal, the community has just completed the first pollarding. 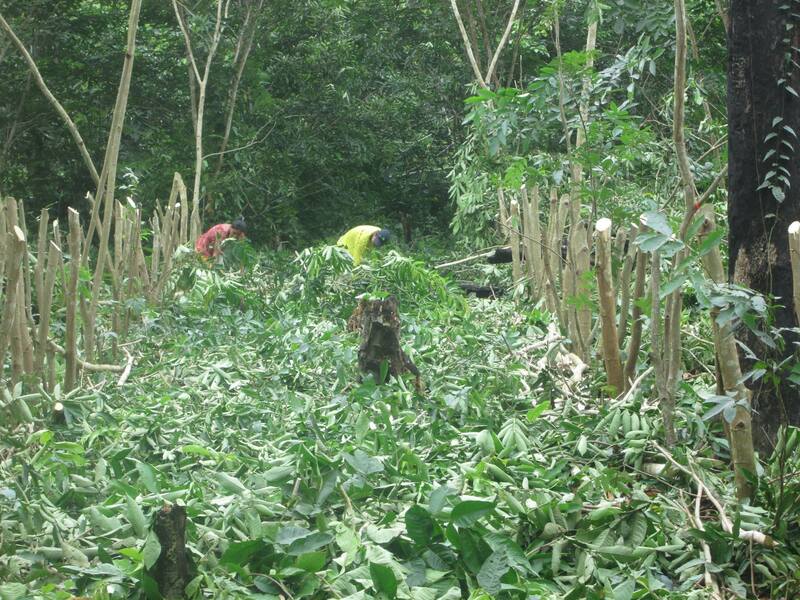 The dense canopy of Inga trees has been reduced to a green mulch and the main stems taken away to be stored for fuel wood leaving about 1/3 ha of fertile ground for growing annual crops such as maize, rice or beans. The pollarding is the culmination of over two years work and testimony to the skills and hard work of our field team, lead by Forest Engineer, Rolman Velarde. We will leave the mulch to rot down a little and in a month the first crops will be sown. 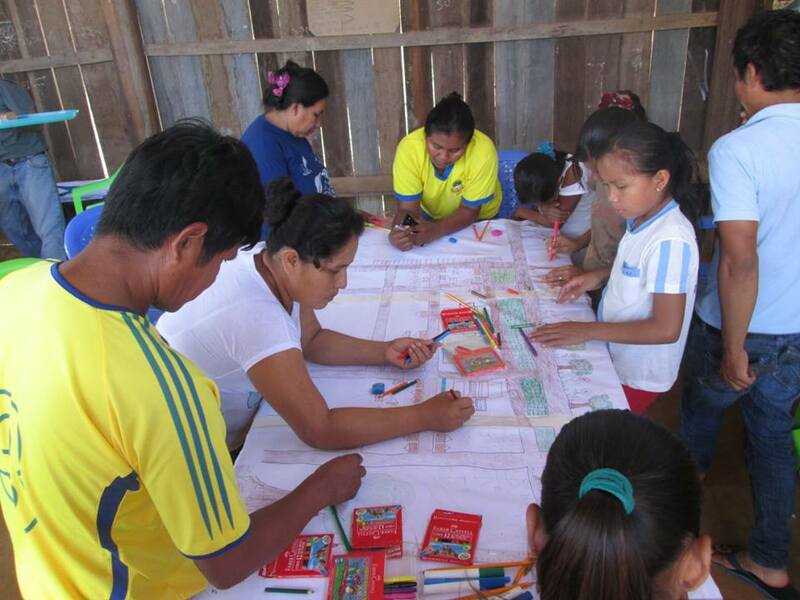 Management of the Motacusal plot is being overseen by the communitie’s children through the ‘Bosque de los Ninos‘ programme which means that they get to choose what will be sown. This is not just important for the engagement of children but also for the community as a whole, linking our demonstration / trial plots with their most valued resource and bringing it to fruition is a powerful symbol. The children have been experimenting with growing various seeds for planting as part of the ‘productive’ part of their school curriculum and I am keen to see what has been planted in a month’s time. There stil remain some challenges though. The anomalous weather associated with El Niño could lead to the crops failing or to the pollarded Inga not recovering as planned. 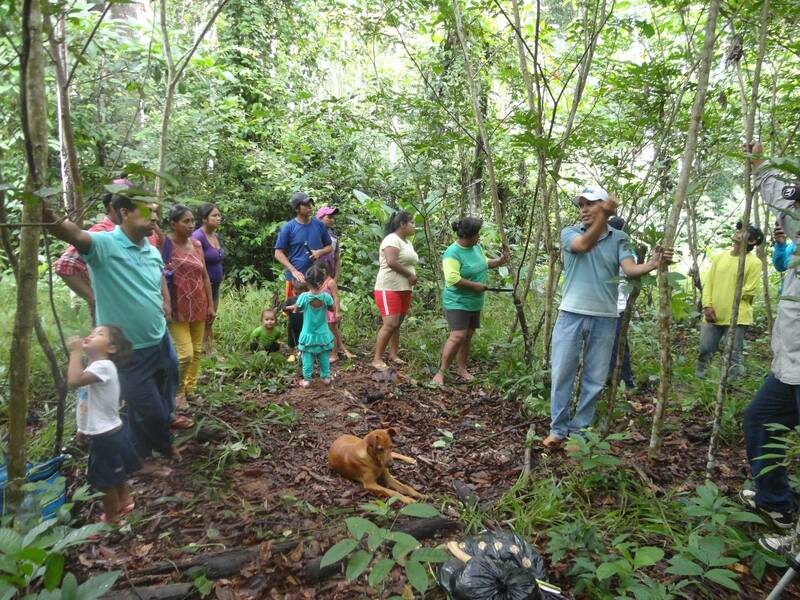 Rolman Velarde explaining to the other participating communities how to pollard Inga trees for alley cropping. Image: Victor Soruco, Herencia. 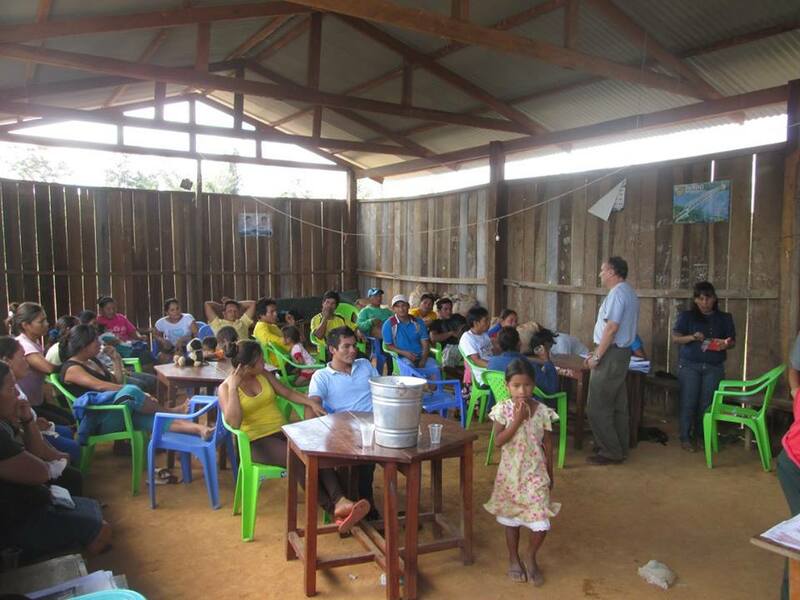 We used the opportunity of this being the first plot to be pollarded to invite representatives from the other particpating communities: Palacios, San José, Jerico and Monte Sinai. This enabled us to train them in pollarding but also for them to get an idea as to what their agroforest plots will look like in a year or so. Rolman Velarde, Terry Pennington y Jaime Leon revisando nuestro sitio en Motacusal por octubre 2015. Este sitio ha sido listo para podar desde julio. Desde julio los árboles de Inga (pacay) en nuestra primera parcela que plantamos al finales de febrero 2014 son bastante grande para podar. Pero no los hemos podado porque las condiciones no son buenos para hacerlo. Como explicó Dr. Terry Pennington, experto sistemas agroforestales con Inga, no debe podar árboles durante la estación seca y el mejor momento para hacerlo es un par de semanas en la temporada de lluvias. La razón de esto es que cuando se quita todas las hojas y las principales ramas de un árbol, la pérdida por encima del suelo se refleja por debajo del suelo. Es decir que cuando podas un parte de las raíces mueren lo que va disminuir la capacidad del árbol a conseguir agua . Durante la estación seca, hay poca agua en el suelo y si ha podado el árbol se queda sin bastante raíces para sobrevivir. Por la Amazonia la estación seca empieza por abril / mayo y termina por octubre / noviembre. Este año ha sido muy seco por el fenómeno de El Niño entonces hemos tenido que adelantar de podar nuestros arboles. Después de podar necesitas dos meses de lluvia. Ya estamos por febrero entonces es possible que no va alcanzar el tiempo para podar antes de la llegada de la estación seca otra vez. Por una otra parcela, Palacio, también es importante seleccionar un buen tiempo para podar. La razón es que este sitio se inunda por un par de semanas cada febrero. Entonces tenemos que asegurar que los arboles tienen el tiempo para brotar o el menos que se podan arriba del nivel del agua. Estamos descubriendo que puede se algo complicado ubicar un buen tiempo para podar! 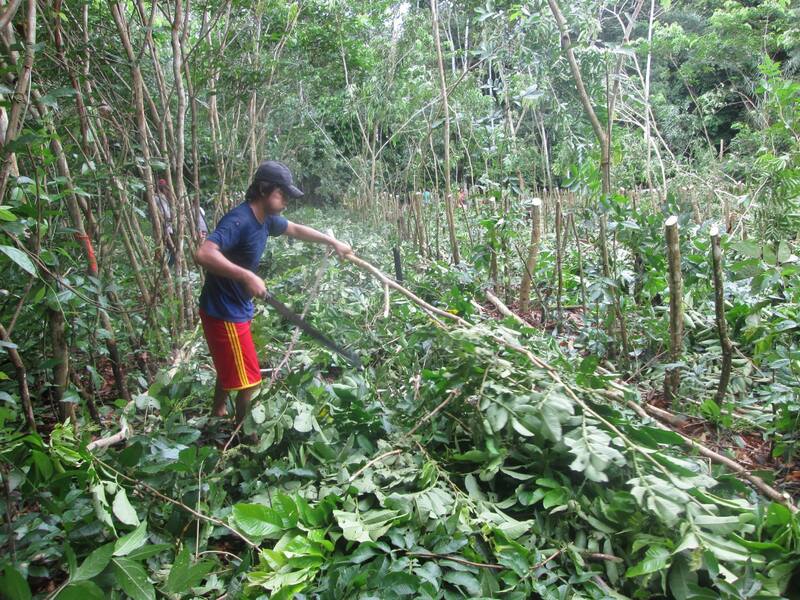 A member of the Motacusal community pollarding the first Inga tree. In addition to getting the timing right it is also important to pollard at the right height, point on the stem and using the right tools. Pollarding involves cutting the top and branches off of a tree. Normally this is done to promote resprouting at the top of the stem but in the case of our agroforest system we want to allow light into our plot for the cultivation of annual crops or fruit trees. This means that we need to cut the stem at the right height so as to shade the crops below and to give them enough time to grow and be harvested before the branches have regrown to their original length. For this purpose we are aiming to pollard at approximately 1.30 m in height, the height of somebody’s chest. It is important to cut the main stem using a pruning saw, a few centimetres above or below a branch point, ideally at a height of between 1.30-1.50 m.
The best place to cut the stem is a couple of centimetres above or below a branch or branch scar. The reason for this is that new branches will sprout from these points. If you cut through the branch point or scar then the tissue from which new branches will develop will be damaged and new branches will be generated at the nearest point above or below it, meaning that it will be higher or lower than desired. The choice of implement is also important. 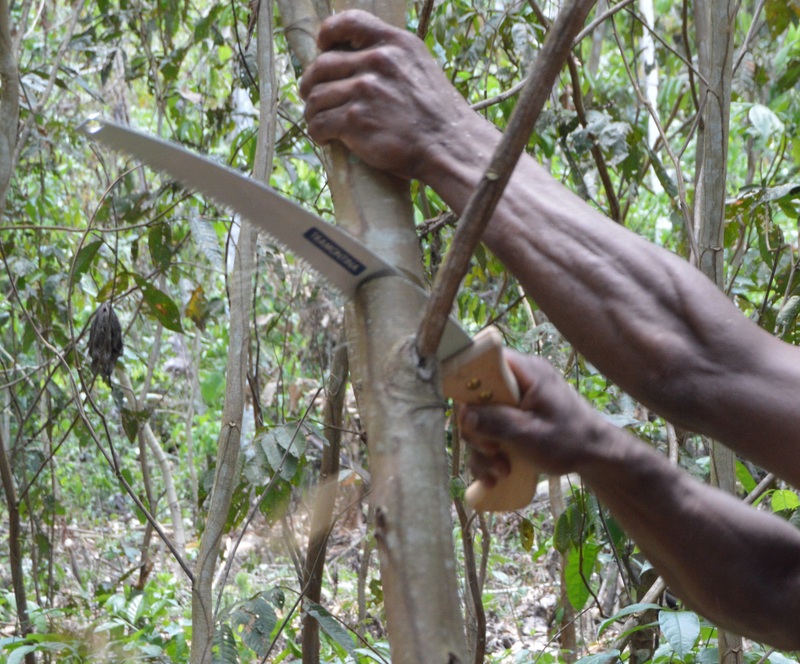 Whilst it is much quicker and more natural to want to use a machete, this is not the ideal way to cut the branch. The reason for this is that it is hard to get a clean clut with a machete as Inga wood splits very easily and the split wood is vulnerable to insect and fungal infections. 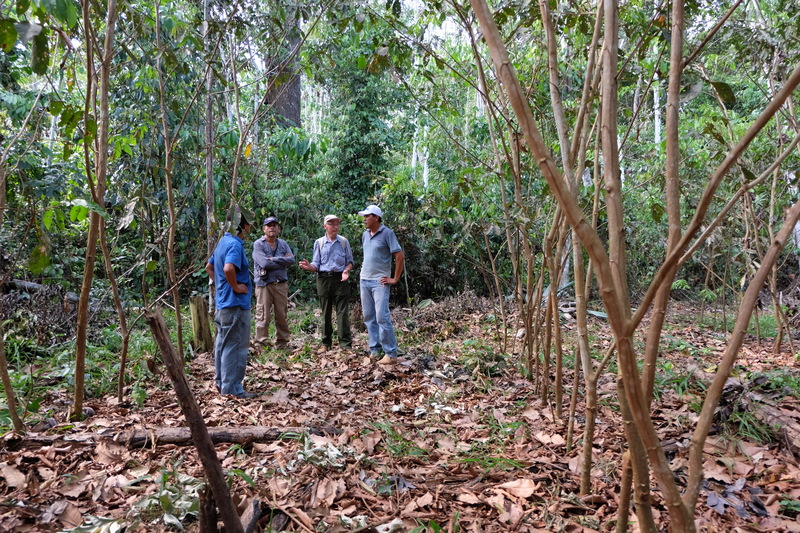 Rolman Velarde, Terry Pennington & Jaime Leon inspecting our Motacusal site in October. This site has been ready to pollard since July. The Inga trees in the first plot that we planted at the end of February 2014 have been big enough to pollard since July. We have not pollarded, however, as the conditions have not been right to do so. 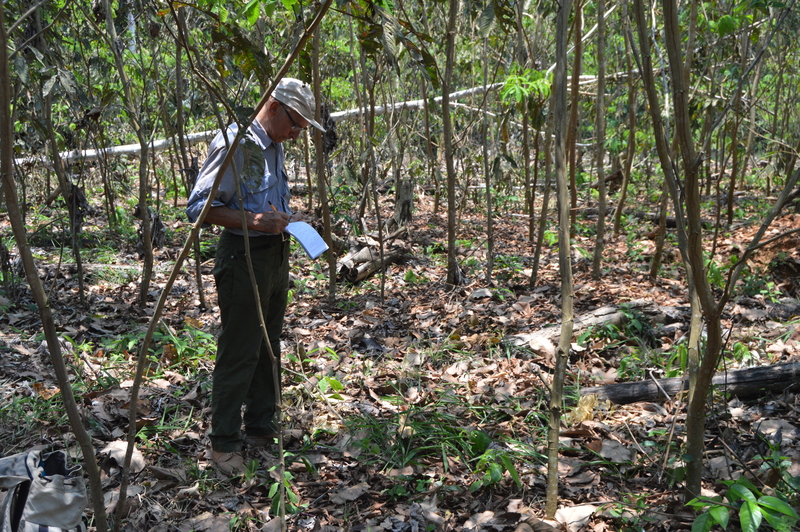 As Dr Terry Pennington, Inga agroforest expert explained, you should not pollard trees during the dry season and the best time to do so is a couple of weeks into the wet season. The reason for this is that when you remove all of the leaves and main branches of a tree, the above-ground loss is mirrored below ground. That is the roots die back comensurate with what was lost above. During the dry season there is little water in the soil and the tree needs all its roots to obtain the moisture it needs. Therefore if you have pruned during the dry season, the tree is left without enough roots to survive. In the case of the Bolivian Amazon, the dry season normally runs from April/May to October/November. This year has been particularly hot and dry, possible a consequence of the El Niño phenomenon, and so pollarding our plot would likely kill all of the trees. We will therefore wait until the middle of November when the rains should have started before pollarding. At another of our sites, Palacio, the timing of pollarding is also important. The reason for this is that it is a site which floods for a couple of weeks each February. We therefore have to be careful that we leave enough time between pollarding and the floods. Or at least make sure that we pollard high enough so that the new shoots emerge above the floodwaters. So here again the timing of pollarding and the associated planting of crops needs careful thought! Como parte de nuestros esfuerzos para fortalecer el impacto de nuestro proyecto Futuros Forest hemos sido muy afortunados de asociarnos con la Fundación innocent para expandir nuestro componente agroforestal con una mejor incorporación de árboles frutales. Fondos de la Fundación innocent nos están permitiendo incorporar tres comunidades adicionales, construir viveros de árboles frutales y desarrollar la capacidad dentro de cada comunidad para germinar, crecer y gestionarlos. Como es el caso de las otras acciones de nuestro proyecto comenzamos conversaciones con cada comunidad, atravez del ONG Herencia, sobre cómo esta adición podría encajar en sus planes de desarrollo. También tienen que pensar en qué tipo de frutales quieren producir: la cantidad para consumo personal y para vender. Si sienten que encaje dentro de sus objetivos luego de pasar a la fase más sencillo de construir los viveros y la obtención de semilla. We believe that the introduction of new approaches to land use needs to be done as part of a broader and integrated plan for a community. 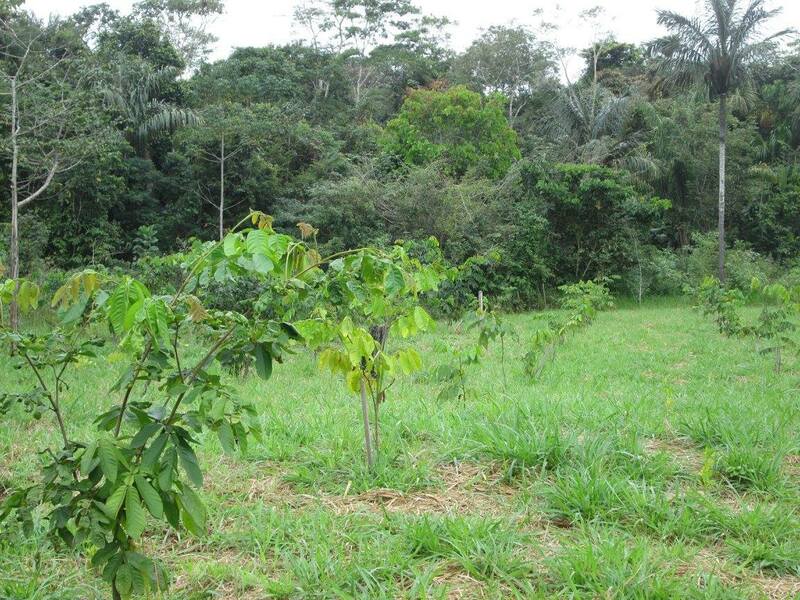 It would make little sense for a community to plant an agroforest plot unless they had considered the costs and long-term benefits of doing so. The reason for this is that at several stages in the process there will be challenges and decisions to be taken that will need require the community to remain motivated and able to evaluate the pros and cons of persisting with the system or abandoning it. Given the general lack of success of previous agroforest initiatives elsewhere we feel that this will be the key to our success. 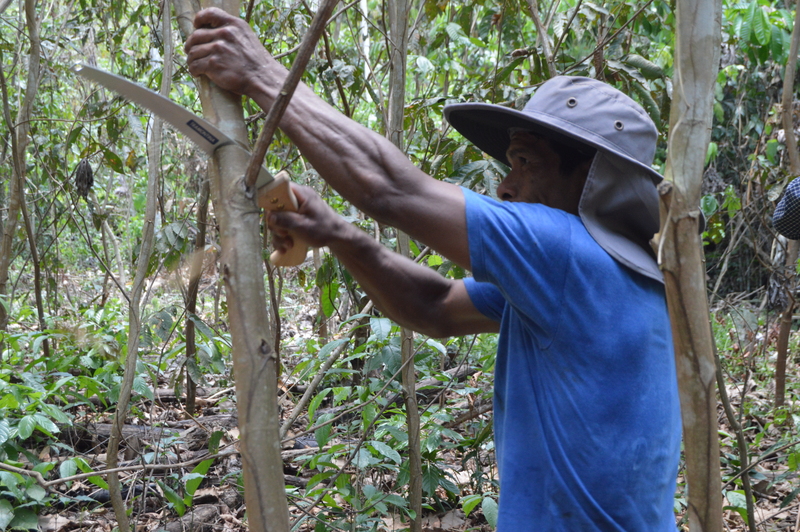 As part of our efforts to strengthen the impact of our Forest Futures project and with the support of the innocent Foundation, our main partners Herencia, have been working with three Amazonian communities: Remanzo, Jerico, Monte Sinai, to develop medium to long-term management plans into which agroforest for fruit and annual crops will be integrated. 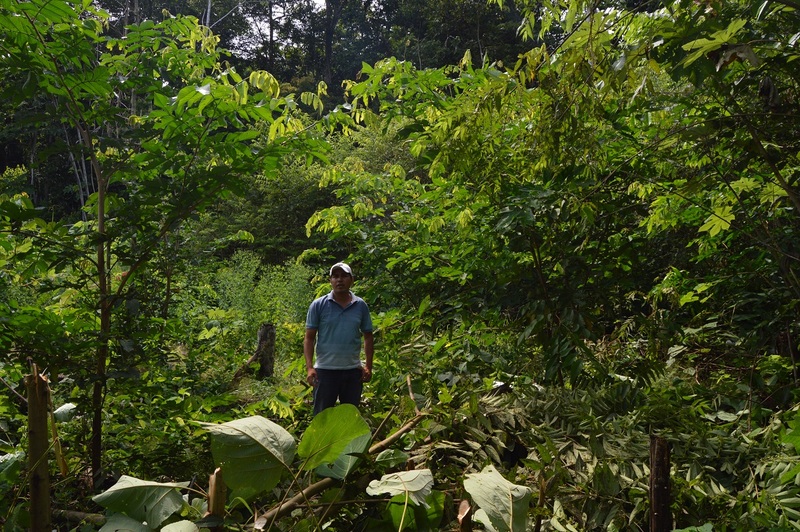 We established our first Inga agroforest plot just over 17 months ago. Since then the seedlings have grown into 5 m tall trees, their crowns touching and shading out any potential weeds. They have captured the site meaning that it no longer needs any maintenance, allowing farmers to choose when to pollard (prune) at a time that best suits them. In the Bolivian Amazon the best time of year to sow plants is at the beginning of the wet season in October and so we are planning to return to complete this last step in the process. 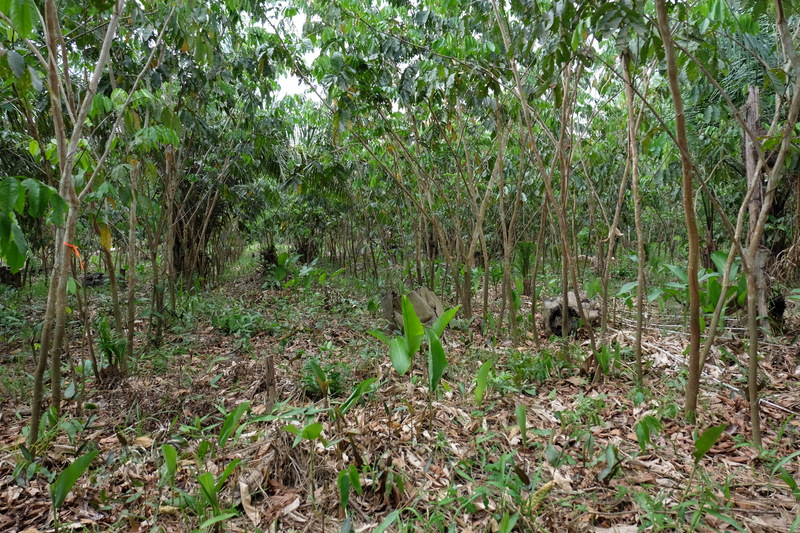 The Las Palmas fruit tree agroforest system 14 months after planting. This site was an abandoned cattle pasture and although the trees are growing slowly they look healthy. Image Rolman Velarde.